Girls growing up in rural Ghana often lack the self-confidence of their peers in urban areas, which can put them at a disadvantage in later life. Gender activists are trying to help. As dozens of schoolchildren at the Kumbungu District Assembly Junior High School in Ghana's Northern Region gather for morning assembly, 14-year-old Kadijah Alhassan stands out in front ready to address the crowd. 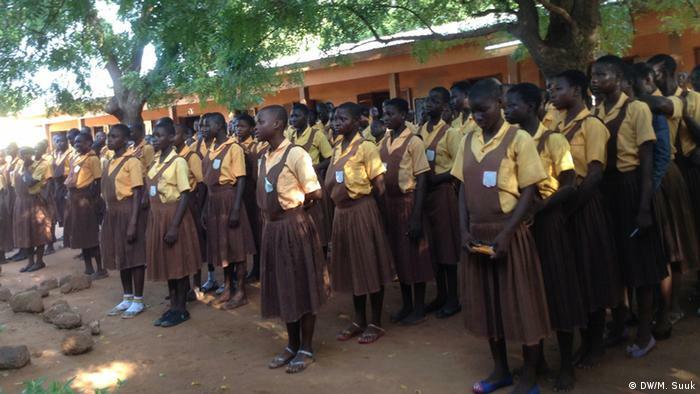 Morning assembly is held in all Ghanaian lower level schools. Students pledge out loud to be obedient and patriotic. 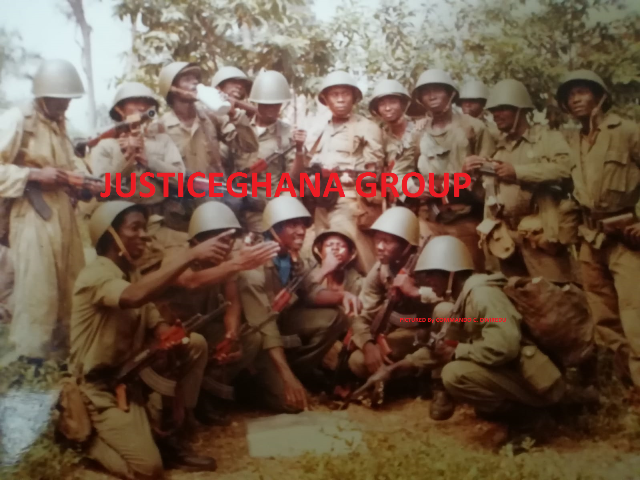 "I promise on my honor to be faithful and loyal to Ghana, my motherland," they declare in unison. 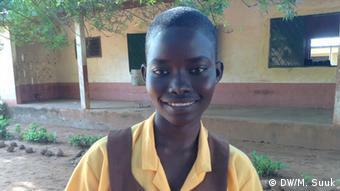 As the moment for her to speak to the school approaches, Kadijah knows she has the necessary self-confidence. She used to be rather more diffident, until she attended a mentorship club. “It helped me to speak in public because when I was not part of this club, I was not able to speak in public. And in class I didn't know how to answer questions but now, I can do that,” she told DW. The mentorship club was the brainchild of Hikmat Baba Dua, 24, a graduate from the Kwame Nkrumah University of Science and Technology. She had noticed that girls from rural backgrounds in Ghana tend to lack in self-esteem, be timid and shy and have difficulty with public speaking. As well as helping the girls develop interpersonal skills, the club also offers them assistance in choosing a career. Dua runs an organization called the League of Young Female Leaders and says most girls need help. "This help can only come from a generational mentorship where we have graduates of tertiary institutions linking them up with our sisters in junior schools," she said. 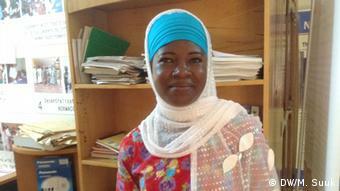 Ghanaian gender activist Hafsatu Sumani believes rural women's low self-confidence is linked to cultural stereotypes. “It is only in urban areas where you will find young girls talking in public or even in the midst of men discussing, but if you go to the villages, you will find meetings where you don't have young girls or even women participating. It is just because they feel that women do not have that knowledge to participate,” she told DW. Sumani says a timid girl becomes a timid woman when she grows up, and this keeps many women from realizing their potential. A single mother of four was so poor she felt forced to sell her newborn son for £130 in rural India. Gauri Shah, 32, who lives in a slum near railway tracks in a village, in Jalpaiguri, West Bengal with her three daughters aged between three and eight years old was abandoned by her husband eight months ago when she was expecting her fourth child. She sold the baby boy to a childless couple but he was rescued after neighbours raised the alarm. The ten-day-old baby is now being cared for at a children’s home. His mother gave birth to him on May 25 but was uncertain how she could raise him alone so she sold the tot – who is yet to be named – to a childless couple seven days later. However, the news soon spread within the village and the local government quickly stepped in and rescued the child. But Mrs Shah refuses to take him back and the little baby was handed over to a children’s home. Her only source of income is the money her 70-year-old mother gets after a day begging for hours on the streets. She said that she feels no remorse about selling off her newborn baby, as she believes it was the best decision for her son and three daughters. She said: ‘My husband left me eight months ago with three daughters. We depend on whatever money my mother manages to collect. She had to borrow Rs 100 (£1) from our neighbour for my delivery. I have no money to raise my children, how will I take care of another? Mrs Shah said she would take back her son if the government helped her with some benefits. The state administration has now given her 60 days to think about whether she will accept the baby. After that the infant will be given away for adoption. Natalie Atkinson has turned her life around with a first class degree in Policing, Investigation and Criminology. A 25-year-old woman with more than 50 convictions has turned her life around to graduate from university with a first class degree in criminology with honours. Natalie Atkinson put her troubled past behind her to be awarded top marks in her Policing, Investigation and Criminology degree. Despite leaving school when she was just 14-years-old she scored 95 per cent in her dissertation. The clever alumna will go on to do a Master’s degree in Criminology after being accepted at the London School of Economics (LSE). She was crowned the National Union of Students (NUS) Endsleigh Student of the Year during a ceremony at Bolton’s Macron Football Stadium. Natalie who studied at the University of Cumbria said: “It’s amazing and to be honest I am still in shock. “I have gone from being a prolific offender living a chaotic lifestyle to living a settled and happy life, so if I can do it then anyone can. “Looking back, if someone had said to me a few years ago that in 2014 I’d be graduating with a first class honours degree, moving to London to commence a Master’s degree and looking forward to a successful career, I would have laughed. “But this is my life. “If you set your mind to it anything is achievable, but it is up to you to make the changes that need to be made. Proud Natalie, from Lancaster, is now an activist for troubled teens and recently presented BBC3 documentary Banged Up and Left to Fail. The show highlights the plight of of youngsters going through the criminal justice system and their lack of prospects. In the hour-long programme she meets jailed young offenders while also liaising with MP Jeremy Wright, Minister for Prisons. She told the cameras how she had more than 50 criminal convictions and claimed to have committed more than 100 offences, including battery, damage, theft and assaulting a police officer. “Throughout my teenage years I was a persistent offender, constantly in and out of police cells and once I turned 18 prison,” she said. “At 13, I used to want to go back to secure units because its the only place I would feel safe and settled. “It all changed when i turned 18, I graduated to the adult criminal justice system, a week after my 18th birthday I was locked up in HMP Styal. “My history of assaults meant I was high risk and put on the wing with the most serious adult offenders. “It was a whole different world, there was violence, fighting, aggression. Natalie added: “Returning to education was one of the biggest challenges I had to overcome. University of Cumbria Student Union Chief Executive Daryl Ormerod said: “Natalie’s story is compelling. “Her ongoing commitment to developing herself so that she may in turn help others as she has been helped, is simply inspiring.